We first cottoned onto Fread Martin, a.k.a. 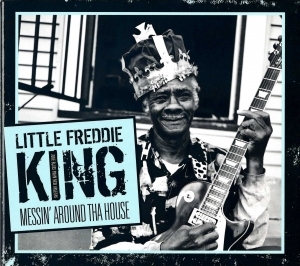 Little Freddie King, a few years back when he released his GREAT "You Don't Know What I Know" disc for Fat Possum, the great Mississippi label dedicated to overlooked older bluesmen who play gutsy, lo-fi blues. 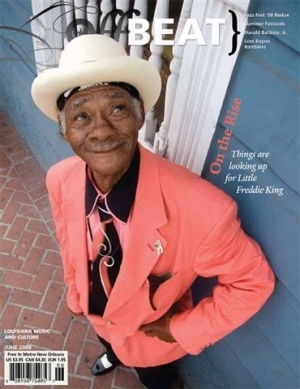 A hard-living character who has been playing the rural electric blues of his native Mississippi in the lowest bowels of NEW ORLEANS' now-devastated Ninth Ward for years, King and his band have a penchant for hard-hitting, minimalist chords and lyrics, delivered by a cracked, heavily lived-in voice. 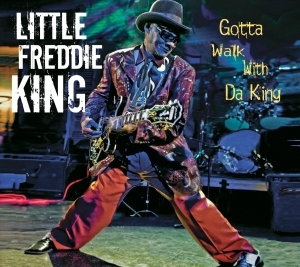 Much of King's material has an old-style blues feel, but he is at his most charming when he strips it down to just guitar and howling vocals as depicted on his 2008 "Messin' Around tha House" and excellent live performance on his 2010 "Gotta to Walk with da King". 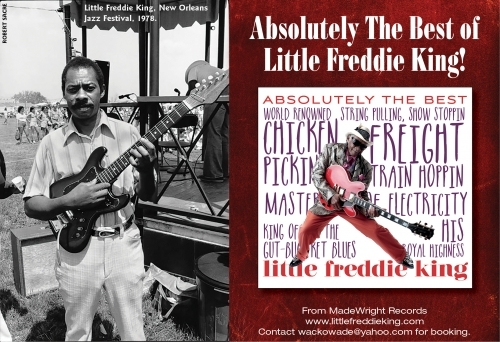 MadeWright Records new 2012 release picks up where "Crackhead Joe" (the premier socio-economic-political song of our time) left off presenting 12 new songs by Little Freddie "gut-bucket" King, cd entitled "Chasing tha Blues". For you Vinyl collector's, check out "Back on Vinyl" 33-1/3 Direct to Disc (D2D), APO Record recording-- available at La. Music Factory & Euclid. Beyonce - "Lemonade" video/cd Mr. King performs a duet with "Miss Bey". Tell management, I am still waiting for my autographed photo. Very nice lady. Music Writer, "75 and Counting"
PONDEROSA STOMP ROAD SHOW presents - Filming by D. Cross for Eyesteel Film, Inc. out of Montreal, Canada. "MISSISSIPPI DELTA BLUESMEN (2014)"
STATE OF LOUISIANA - "AMBASSADOR AWARD - 2013"
THE 12TH INDEPENDENT MUSIC AWARDS"
Selected Best Blues Album "CHASING THA BLUES"
you made an old dude SMILE. http://frenchquarterly.com/music/item/7-little-freddie-king-new-orleans-monarch-of-the-blues BY: KIM WELSH, musicologist. "EXTREMELY LOUD AND INCREDEDIBLY CLOSE"
"THE 11TH INDEPENDENT MUSIC AWARDS"
Nominated by a distinguished judging panelist in the Blues Album Categroy for "GOTTA WALK WITH DA KING" in The 11th IMAs. "LOUISIANA MUSIC HALL OF FAME INDUCTEE"
"LIFETIME ACHIEVEMENT AWARD FOR BLUES EXCELLENCE INDUCTEE"
"Gotta Walk With da KING", 2010 live performance. 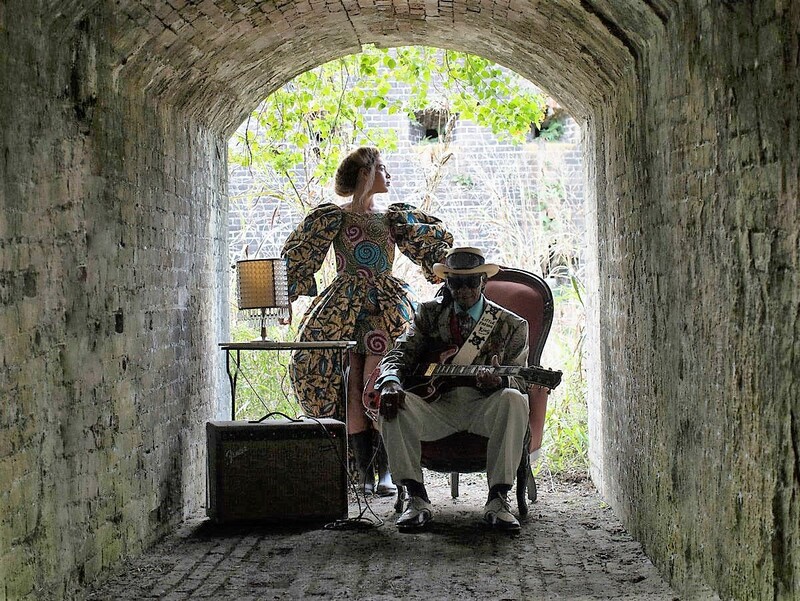 "MISSISSIPPI BLUES TRAIL MARKER - SUMMIT ST."
2012 performance and song "Night Time in Treme"
with a world wide 2012 marketing campaign. "LOUISIANA MUSIC FACTORY 20TH ANNIVERSARY". "Bus Station Blues" preserved for posterity the 2003 French Quarter Festival. WWOZ Collection web page. It is a unique example of the deep and rich blues music of New Orleans. NEW 2017 release: (IAM NOMINATION FOR BEST "LIVE" CD. 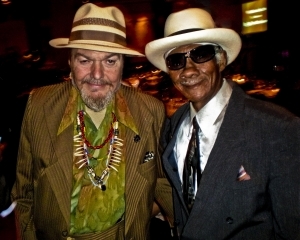 "The great New Orleans musical tradition is usually steeped in jazz, r&b, soul and funk, which is why LITTLE FREDDIE KING is such a unique local treasure - he delievers nothing but authentic Mississippi Delta juke-joint blues, pure and uncut, presented with the kind of laidback stagger and sometime frightening shaggy dog tales you can only find in The City That Care Forgot." "King plays a jumped-up electric blues that's light on solos and heavy on hypnotic repetition....Sometimes, when the hour is late and the beer is flowing freely, the blues sounds like DANCE MUSIC." 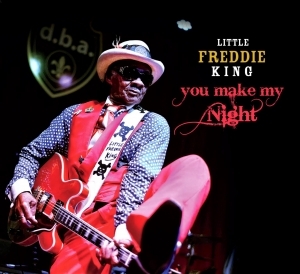 IMA MUSIC AWARD 2015 "BEST BLUES CD"
I had the privilege of meeting this amazing Mr. Little Freddie King and listening to him and his band. ..incredible! Thank you. ..i will never forget it. 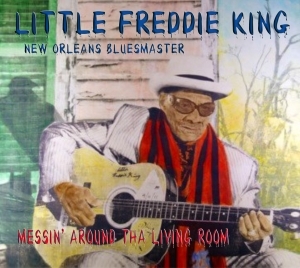 .gonna order the CD..
2015 release: "MESSIN' AROUND THE LIVING ROOM"
AVAILABLE: www.louisianamusicfactory.com or www.amazon.com or Itune. 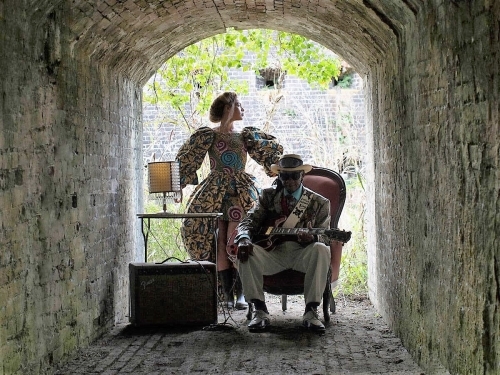 "He's one of the last of the blues generation to migrate to New Orleans who formed a SUBTERRANEAN subculture of downhome Mississippi blues artist. He presents the roots and rawness that's missing from a lot of blues today - or what passes for blues. He's the real thing." JIM O'NEAL, Founding editor Living Blues Mag. 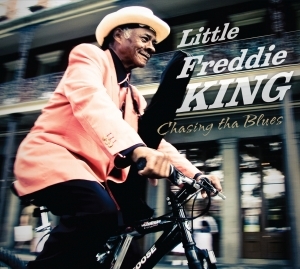 Little Freddie King's life has always been hard. Hell, not long ago he was blown out of New Orleans by Katrina and he went missing for a time. When he finally settled back into town, Freddie was forced to move out of his new apartment by toxic Chinese dry wall that was wrecking the place. It's always been this tough and it always will be. CHASING tha BLUES takes you on a rough ride through Freddie's life. You get to meet Crackhoe Flo and hang out at the Bucket of Blood. This is a down and dirty straight forward, no-frills CD that captures real juke joint blues on a festival stage. Recorded LIVE at the Annual "Thirsty Ear Festival" in New Mexico, you can stand in the audience and yell "Crackhead Joe!" or "Who shot you Freddie?" You can feel the love and hear Freddie's soul. On behalf of Music Resource Group, The IMAs, and our distinguished judging panelists, it is our pleasure to congratulae Little Freddie King on being nominated in the Blues Album Category for "GOTTA WALK WITH DA KING" in the 11th INDEPENDENT MUSIC AWARDS. 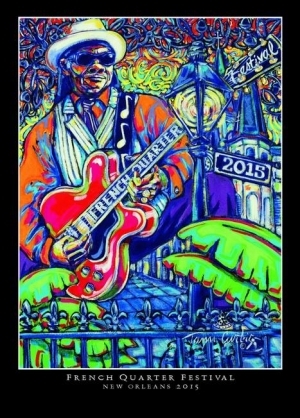 My blues loving fans, I have been deeply honored in being selected for the 2015 FRENCH QUARTER FESTIVAL poster. You can purchase one as a gift or for yourself at WWW.FQFI.ORG.